"Gold Steeple Tie Back Tassel" Accentuate your tapestry with a lovely plush steeple shaped tassel. Overall drop is 27 inches. 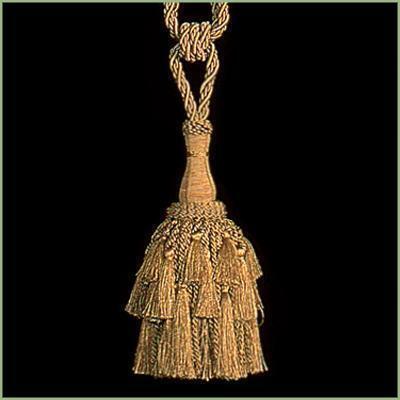 Cording is braided and the steeple shaped tassel is dense, soft and luxurious. The gold shade is a mix of rich golds and beiges. Price Includes (1) Tassel. Width: 5 inches Length: 9 inches PLEASE NOTE: Shipping ONLY within the continental U.S. Hawaii, Alaska, and Puerto Rico must contact seller for shipping quote before ordering.